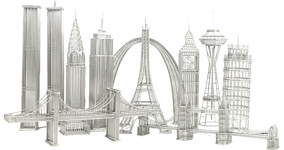 Each steel wire model is designed and soldiered to create the most authentic and stunning Architectural replica of a world icon. We are adding additional wire models to our collection to provide a comprehensive collection for your home decor. Many of these popular statues are used for awards. We can add a custom printed brass plaque to any of our replicas. Enjoy the clean design and look of pure steel wire models to display at home or office. Who do you know that would love an authentic model of their favorite world icon? "The most AMAZING gift I've ever received! Impressive!" Steven J. "I collect the entire series and love to display them on my mantel." Joan M.
Wire Arc de Triomphe Model Statue An elegant metalic Arc de Triomphe model of France's icon. Wire Temple of Heaven Model Statue An elegant metalic Temple of Heaven model of China's icon. Tower Bridge Wire Model An elegant metallic model of London's iconic Tower Bridge.